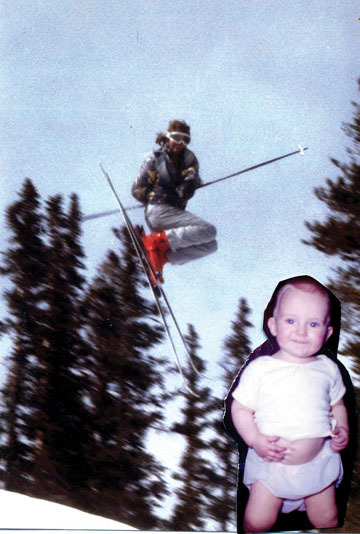 Scott Rawles aka "The Banana Man" aka "USSA Freestyle Moguls Coach" is wished a happy 50th birthday today. Join him at A-Basin Friday to make some turns. Also, there's an open house 4 p.m. Friday at Suzie and Jerry Rawles' home. Good morning and welcome to Summit Up, the world’s only daily column that wants to enter into the International Co-Ed Freestyle Shoe-Throwing Competition, which we’re guessing is held annually in Burpaloopee, India (Callcenterbombalai Province). We say this because we saw a video on the BBC News website (http://bit.ly/2kBiF) that showed angry shareholders throwing shoes and other stuff at the CEO of Fortis, which is some company we’ve never heard of but which, according to its website, is “an international provider of insurance services …” blah, blah, blah ” which means, in short, that they’re probably evil greedheads who lost shareholders a crap-load of money because they acted like mad dogs selling credit-default swap thingies in a highly unregulated market. Anyhoo … although we don’t advocate violence of any kind, throwing a shoe is pretty mild compared to, say, running the CEO through with a cutlass or working him over with a bulawa. And, as we well know, our last president, ol’ What’s-His-Name-Chilling-In-Texas-Now-Thank-God once had a shoe chucked at him by an Iraqi journalist. MILLIONS OF SUMMIT UP READERS: Hold the phone! What the hell is a bulawa? SU: A type of ceremonial mace. SU: A type of club. Sheesh ” all these questions! Anyway, underneath the video of the CEO getting stuff hucked at him was another video about people in India actually practicing throwing shoes at a dummy, presumably in preparation for the next time they encountered a politician they didn’t like or a CEO who’d lost their collective shirts for them. Looking at the video, these folks don’t look like they own shares in anything more substantial than a yak shank, but who are we to judge someone’s net assets on the cut of the burlap sack they’re wearing? The BBC site brilliantly categorized the practice session as a “master class” on shoe-throwing, and we believe we shall shortly start practicing in our backyard. We believe there’s a continuum of anger that can be conveyed by hucking footwear. Mildly peeved? Chuck a flip-flop. Really super-PO’d? Go with an army boot or an ice cleat. Pretty annoyed but mildly attracted to the object of your derision? Howzabout pitching a pair of espadrilles at them, or some huarache sandals? Say it with hurled footwear, we say, but choose carefully. Hope you enjoyed the sunshine Wednesday, since we hear it’s supposed to cool down and be crappy out for the next few days. Surely you jest, Mr. Weatherman! Maybe it won’t come true. But it’s almost May in Summit County, which, meteorologically speaking, means anything goes. Hang in there, we out.